← We won the Business Matters Going Green Award! Sussex Green Living is competing in the UK wide Biscuit Wrapper Recycling competition, the beneficiary being the William Penn Primary School in Coolham. This competition is to see who can save the most used sweet biscuit wrappers (and brand) from landfill. At the time of writing this blog we were 18th in the UK. With a final push over the next 3 weeks we could be in with a chance of winning anything between £250 – £20 for the school, plus save all those biscuit wrappers from landfill. Recycled biscuit wrappers can be put in the special recycling bin in the playground at the William Penn Primary School in Coolham. The Grand Prize Winner will be awarded 25,000 TerraCycle points in their TerraCycle account, redeemable for a £250 contribution to the school or charity of their choice. In addition, the winning location will be given a McVitie’s hamper full of biscuits! The First Runner Up will be awarded 15,000 points in their TerraCycle account, redeemable for a £150 contribution to the school or charity of their choice and a McVitie’s hamper. The Third to Tenth placed winners will each be awarded 5,000 points in their TerraCycle account, redeemable for a £50 contribution to the school or charity of their choice. The Eleventh to Twentieth placed winners will be awarded 2,000 points in their TerraCycle account, redeemable for a £20 contribution to the school or charity of their choice. Come on get eating biscuits, what better excuse could there be! 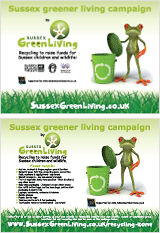 We want you, the people of Sussex, to take some ownership of www.sussexgreenliving.co.uk. Forward your suggestions for events, videos, parks and green spaces etc to be added to “your” site. My name is Carrie Cort, I set up Sussex Green Living out of concern for the way we humans are treating the planet which sustains us. With motherhood in 2008 came concern about environmental sustainability and a burning desire to learn how we can live more environmentally friendly lifestyles, in harmony with nature. I have always had a passion for the countryside, animals and the natural environment. Most of my career has been spent in marketing and communications, mainly within education and the landbased industries, latterly using the power of video communications. In an effort to help create a climate for change I decided to use my knowledge and digital skills to share ideas which anyone can adopt, saving money and the planet. I’m not an expert, just an ordinary person who is on a greening journey and wanting to pass on what I’ve learnt to others. Let’s all make some simple changes, become more resilient and try to lead simpler, less materialistic and consumerist way of life. 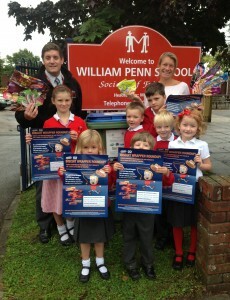 This entry was posted in Children & nature, Eco School William Penn, Green stats, facts & news. Bookmark the permalink.